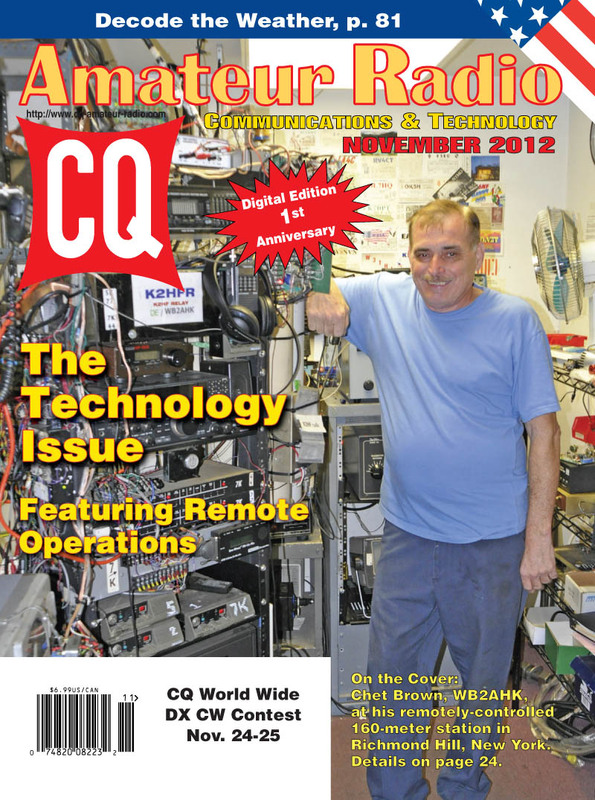 The November issue of CQ is our second annual Technology Special, as well as the first anniversary of our digital edition! 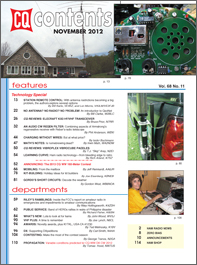 No matter whether you read this issue in print or online, it is once again full of articles and columns reflecting the wide range of amateur radio technology, with a special focus this time on remote operations. We start out that focus with our cover, showing the remotely-operated HF station of Chet Brown, WB2AHK, at his family's business near the Jamaica train station in Queens, New York. Chet lives seven miles away on a small city lot without antenna space for his favorite band - 160 meters - so he has the station at work and operates it remotely from home. The theme of staying active without a station at home continues with our first two feature articles, "Station Remote Control," by Bill Karle, VE4KZ, and Len Morris, VA3LM/VE3FJB; and "No Antenna? No Radio? No Problem! - An Introduction to QsoNet," by Bill Clarke, W2BLC. Our Technology Issue continues with a CQ Review of the new Elecraft KX3 HF/VHF transceiver, by Bruce Prior, N7RR, followed by a fascinating look at mixing old and new technology to improve signal reception in "An Audio CW Regen Filter Combining Aspects of Armstrong's Regenerative Receiver with Reber's Radio Telescope," by Phil Anderson, W0XI. Next, battery expert Isidor Buchmann writes about "Charging Without Wires: Convenience, but at What Price?" and T.J. "Skip" Arey, N2EI, offers a CQ Review of the new "Vibrocube" paddles from Vibroplex. Among our columnists contributing to the Technology Special are "Math's Notes" editor Irwin Math, WA2NDM, who asks, "Is Homebrewing Dead?" 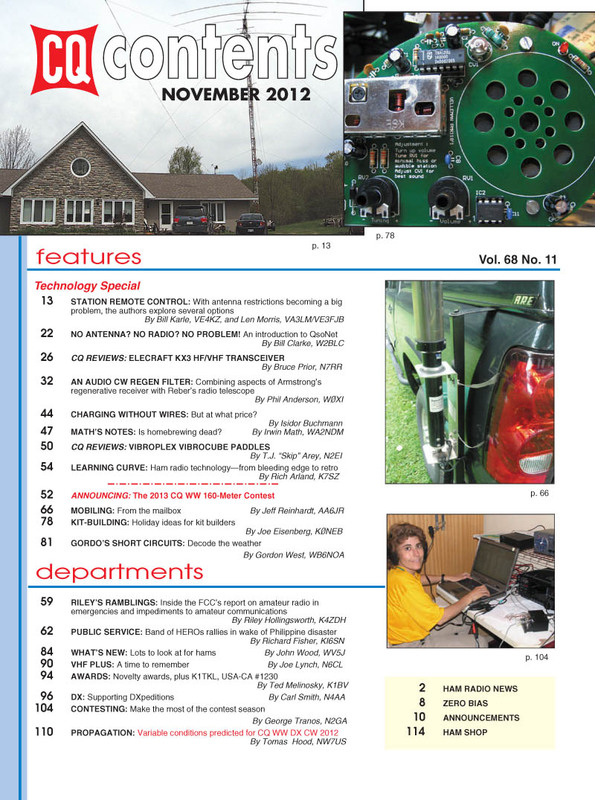 and "Learning Curve" editor Rich Arland, K7SZ, who explores "Ham Radio Technology: From Bleeding Edge to Retro." But not everything is about technology … As always in our November issue, we have the rules for the 2013 CQ World Wide 160-Meter Contest. Once again, the contest will begin at 2200 UTC on Friday and will end at 2200 UTC on Sunday (CW on January 25-27; SSB on February 22-24). Remember, there is a new 5-day deadline for submitting logs. "Riley's Ramblings" editor Riley Hollingsworth, K4ZDH, goes "Inside the FCC's Report on Amateur Radio in Emergencies and Impediments to Amateur Communications;" Public Service Editor Richard Fisher, KI6SN, reports on the amateur radio response to magnitude 7.9 earthquake in the Philippines; Mobiling Editor Jeff Reinhardt, AA6JR, dips into the mailbag to review several readers' mobile installations, and Kit-Building Editor Joe Eisenberg, K0NEB, offers up some "Holiday Ideas for Kit Builders." "Gordo's Short Circuits" editor Gordon West, WB6NOA, also looks at some holiday gift ideas, as does "What's New" editor John Wood, WV5J. "VHF-Plus" editor Joe Lynch, N6CL, takes some time out this month to remember several prominent hams who became Silent Keys this year, all of whom had significant impact on VHF and/or VHFers. Awards Editor Ted Melinosky, K1BV, looks at some novelty awards; DX Editor Carl Smith, N4AA, writes about supporting DXpeditions; Contesting Editor George Tranos, N2GA, has suggestions for making the most of the contesting season; and Propagation Editor Tomas Hood, NW7US, predicts good conditions for the SSB weekend (Oct. 27-28) of the 2011 CQ World Wide DX Contest and variable conditions for the CW weekend (Nov. 24-25). See Tomas's last-minute forecasts on his website at http://prop.hfradio.org. That's a brief look at what's coming up in the November issue of CQ magazine, which should be on newsstands and in subscribers' mailboxes the first week of November, and available to digital subscribers as of November 1. 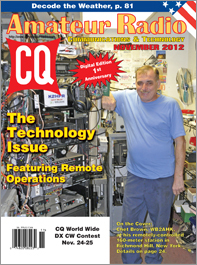 For information on becoming a CQ subscriber -- to either our print or digital edition -- click here. Now available: 2013-2014 CQ Calendars! Click here to order! Zero Bias - "Olympics & Radiosport"
Coming up in December: The 100th Anniversary of Amateur Radio Licensing and the Battleship Missouri Amateur Radio Station in Pearl Harbor. On the Cover: Chet Brown, WB2AHK, at his remotely-controlled station in Richmond Hill, New York.